Welcome to Ankylosaurus.org our website about one of the most unusual looking and interesting of dinosaurs. Ankylosaurus was an armored dinosaur that ate plants ("herbivore). It lived at the end of the Cretaceous period, between about 74 and 65 million years ago. You can recognize Ankylosaurus by its body, which was close to the ground and protected by plates. It had a short neck and a relatively small head, but it had quite a long tail, and the tail was equipped with a club which it could use to defend itself. An adult Ankylosaurus could be sized up to 33 feet (10 meters) in length, and probably weighed around 4 tons. 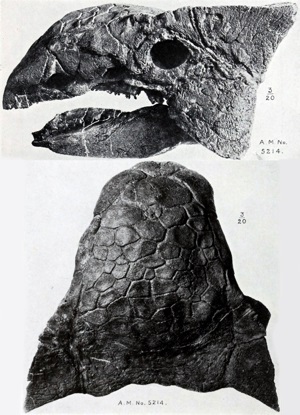 Ankylosaurus was name by Barnum Brown in 1908. Its name, means "stiffened lizard". 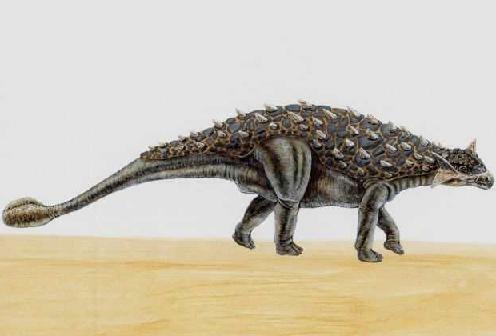 Ankylosaurus was protected by bony armor in its skin (osteoderms) and a club in its tail. What did Ankylosaurus eat? How do we know? How Ankylosaurus was discovered and named. Where did Ankylosaurus live? What was its habitat like? Some key facts about Ankylosaurus. What Ankylosaurus fossils have been found? Where were they discovered? How did Ankylosaurus get its name? What does its name mean?